Many kitchen manufacturers currently use traditional photography to market their products, going to great expense building elaborate studio sets and hiring teams of designers, stylists and photographers to create the aspirational imagery they need. The whole process takes many weeks of hard work by not only the construction crew but also the management team from the manufacturer who have a crucial and necessary role in directing and supervising the build and subsequent photo shoot and managing the dozens of people involved. In all, the manager could spend weeks away from their desk involved in the coordination and control of the photography process which would create a huge amount of extra work and additional stress to what we can assume to be an already busy and engaged executive. After this process has taken place extra time will then have to be spent choosing the best photograph from the dozens that would have been taken with lighting and camera positions being scrutinized to find the most appealing image. The chosen selection of images will then be sent to a post production house for final editing and processing. From start to finish the creation of the images could take from 3 weeks to a few months. All through this process the images will be at risk from many potential pitfalls. Set construction could be delayed, interior designers could fall ill, photography equipment could fail and most damaging of all – the images might not look how they were expected to! What would happen if the kitchen didn’t look right? What if the props looked out of place? Who would be blamed and what could be done about it? Unfortunately traditional photography does not give you many options. If you take photographs then by and large you are stuck with what you are given. Any changes that could be performed would be costly and time consuming and very difficult to carry out effectively. So how do you escape all those pitfalls and keep all that time to carry on with your duties? The ideal scenario would be to use CGI’s. Instructing a 3D studio to create a kitchen CGI would take the hassle from your desk, it would free up your day and it would happen in a much more manageable time frame. You are involved at the initial design stages as normal but when, with traditional photography, the construction of the set begins and there is a lengthy build and dressing of the set, 3D kitchen production can begin straight away. So a protracted and lengthy process turns into a much shorter and efficient 3D workflow delivering the final kitchen visualisations in a fraction of the time. In the meantime you can continue with your day job content that your kitchen CGI’s are being produced for you to your exact specification. There is no need for extra management or overseeing. What if things go a little awry? Your amends, changes and design tweaks are conveyed to the studio and carried out immediately. There are no expensive post production costs and you are free to change any aspect of the scheme at any point. Kitchen CGI’s stand in a league of their own when it comes to building on your initial investment and expanding the range of images you hold of your kitchens. 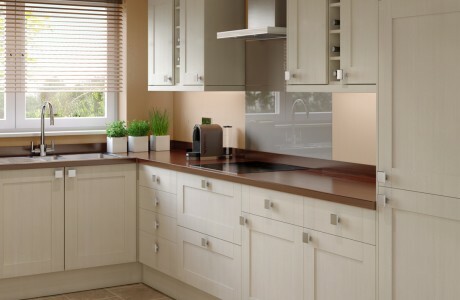 Computer generated kitchen visualisation sets allow you to showcase many different styles of units and worktops within the same environment and with simple and easy changes to the colour scheme and decor would make each 3D kitchen look entirely different from each other. The price to do this would be very much cheaper than traditional photography and the production process would take a faction of the time. Many clients take this a step further and create a master kitchen CGI that is then dressed in each and every style of unit, worktop and splash back and the resulting kitchen visualisations are composited into an interactive presenter that is programmed to allow a user to choose a personalised kitchen set-up from the hundreds of different combinations that could be available. This technology can then be hosted on the website to give potential customers a much more immersive experience when choosing their kitchen.